Jazz Up Your Eggs – As you know, the medical community goes back and forth on the subject of eggs, and I don’t believe any single food has caused more controversy and discussion. Right now they’re in favor. 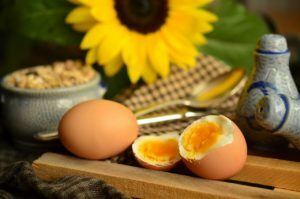 If you do like eggs, the best way to consume them is to look for high Omega-3 eggs. While you’re at it, you might as well look for organic eggs, as they are certified by the USDA to be hormone and pesticide free. Try these health ways to enjoy your morning eggs. Avocados make a great addition to a healthy, protein filled breakfast that will keep you full until lunch time. Proceed as if making egg salad, combining all the ingredients and mixing well together. This mixture is best if consumed immediately, so scale the ingredients and make only enough to serve your immediate needs. Mash all items together, and if desired, a nice taste kick is adding a few teaspoons for chopped parsley. You can enjoy this on toast in the morning or in a whole wheat wrap. Add a handful of almonds to make a super nutritious breakfast treat.